Detailed information about this exciting new release can be found below. CD Available in stores and online, including iTunes, Amazon and AmazonMP3. This recording is a calming, pleasant and eclectic collection. Piercy's versatility is evident in this diverse collection of music. The progression if music on this disc has a natural ease, particularly the opening French works, which effortlessly flow from one to the next. Piercy's flexible sound contains a variety of colors, achieving an even tone from one register to the next. The tango movements are spectacular and are the highlights of this recording! The CAFE recording presents a diverse combination of music that shows both how versatile these artists are, and how effective the combination of clarinet and guitar can be. 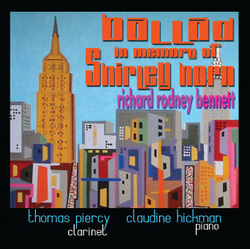 Preview "Ballad in Memory of Shirley Horn"
Sir Richard's lovingly crafted canvas from which the performers extract full measure. First & foremost - beautiful, touching music. There is a plaintive quality throughout, a wistful murmur that throbs right below(or is it above?) the surface. Congratulations on this world premier by such a great contemporary composer. A convincing interpretation of the piece. The clarinet playing is excellent; wonderfully wide coloristic & dynamic range. The piano has a rich, warm tone. Now available in stores and at iTunes, CDBaby, amazon.com and many more sites. 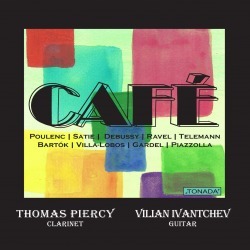 Other recordings featuring clarinetist Thomas Piercy. Detailed information about this exciting new release from Tonada Records. Music for Clarinet and Guitar. Mouvements Perpétuel No. 1 (Assez modéré). Composed for piano in 1890 as part of Trois Gnossiennes. Composed for piano in 1888 as part of Trois Gymnopédies. La fille aux cheveux de lin (The Girl with the Flaxen Hair). Composed for piano between 1909 and 1913; included in the two books of Préludes. Pièce en forme de Habañera. Originally composed as “Vocalise étude en forme de Habañera" for bass voice and piano in 1907. Composed for oboe and continuo. Composed for piano in 1915; later arranged for orchestra by Bartók. Based on folksongs and dances collected by Bartók from peasants and Gypsies. Composed in 1925 for voice and piano as part of Seréstas. Composed in 1933 for voice and piano as part of Modinhas e Canções. Bachianas Brasileiras No. 5. Aria (Cantilena). Composed between 1938 and 1945 for soprano and eight cellos. Later arranged for soprano and guitar by Villa-Lobos. Composed in 1923 for voice and piano. Composed in 1935 for voice and piano. Composed in 1986 for flute and guitar. Composed in 1963 for voice and piano. Recorded and Mastered at MacIntyre Music by Reed Robins. Mouthpiece: Lelandais/Holdsworth - 1010. Reeds: Handmade. Ligature: String. Microphones: Clarinet / Neumann TLM103; Guitar / Neumann KM-184. Microphone Preamp: Millennia Media - HD-V3. Audio Interface: MOTU – 828 MK2. Software: DAW: MOTU - Digital Performer. Plug ins: Audioease - Altiverb 6; PSP - VintageWarmer 2; Waves - L3 Ultramaximizer. Monitoring: ADAM Professional Audio System 1-10 speakers; Mackie Big Knob Studio Control Center. Control Surface: Mackie - MCU and 2 extenders. トナダ・プロダクションズ New York, NY, U.S.A.
THOMAS PIERCY is a critically acclaimed musician with orchestral, concerto, solo recital and chamber music appearances throughout the Americas, Europe and Asia. His performances have been described by critics as "passionate," "pulling out all the stops," and “the best Piazzolla in NYC,” and by the New York Times as “brilliant,” “playing with refinement and flair” and “evoking a panache in the contemporary works.” Mr. Piercy performs varied concerts of standard classical music, jazz-inspired programs, contemporary works, pieces written specifically for him and his own original arrangements, compositions and collaborations. He performs and records on rare English-bore rosewood clarinets made for him by Luis Rossi of Santiago, Chile. He studied at the Juilliard School and Mannes College of Music in NYC in addition to Shenandoah Conservatory and Virginia Commonwealth University. He studied extensively with the English clarinetist Gervase De Peyer; additional studies were with Stephen Johnston, Kalmen Opperman and Leon Russianoff. Mr. Piercy has performed at many of the world’s acclaimed concert halls including Carnegie Hall (NY, NY), Lincoln Center (NY, NY), the Kennedy Center (Washington, DC. ), Centre Pompidou (Paris, France), Wigmore Hall (London, England), Accademia di Santa Cecilia (Rome, Italy) and Parthenon (Tokyo, Japan). A frequent performer of new music, Piercy has premiered numerous compositions, many of them written for him. Pulitzer Prize winner and Grammy Award-winning composer Ned Rorem wrote his only clarinet and piano piece, "Four Colors," for Mr. Piercy; the work had its premiere at a concert celebration for Mr. Rorem at Carnegie Hall. Mr. Piercy has recorded many of Rorem’s chamber works featuring the clarinet. A versatile artist defying categorization - the clarinetist on the Emmy Award-winning Juno Baby CD and DVDs; performing Mozart with mezzo-soprano Frederica von Stade; playing Broadway songs with Raoul Julia; working with the composer Leonard Bernstein; appearing in a KRS-ONE rap music video; performing concert improvisations with pianist Donal Fox; recording with members of Maroon 5 - as an instrumentalist, singer, director/music director/conductor and actor, he has performed and recorded for Broadway and Off-Broadway, commercial recordings, television, radio, videos, and movie soundtracks. VILIAN IVANTCHEV began his music studies in his native country, Bulgaria, at the Lubomir Pipkov National Music School. When he moved to New York City at age 11, he joined the honors program at the Mannes College of Music Preparatory Division. After graduating from the La Guardia High School for Music & Art and The Performing Arts, he was awarded a scholarship to continue in the Bachelor of Music program at Mannes College of Music.Mr. Ivantchev has played in some of the most prestigious venues in New York City, including Carnegie Hall's Weill Recital Hall, Symphony Space and The National Arts Club. He is a recipient of The Chamber Music Society of Lincoln Center Award that enabled him to perform in chamber ensembles at Alice Tully Hall. Recent performances include appearances with the Orion String Quartet and the Cygnus Ensemble at Weill Recital Hall. Mr. Ivantchev has recorded several CDs of the music of Terry Champlin with the Mannes Guitar Quartet, violinist Sabina Torosjan, guitarist and vocalist Helen Avakian, composer and guitarist Terry Champlin, and legendary percussionist Jeff Haynes. As a member of "Duo Accord" with violinist Sabina Torosjan, Vilian recorded a 70th birthday commemorative CD of the music of composer David Loeb.